Bionic Briana: Pumpkin Pie Spice Greek Yogurt. Pumpkin Pie Spice Greek Yogurt. Maybe by the middle of October you are sick of all things pumpkin-flavored. But not me. On Saturday, while I was digging through my cabinet looking for spices to make that delicious pumpkin cheesecake bread, I found a bottle of pumpkin pie spice that had been pushed to the back when the pumpkin-flavored season came to an end last year. Determined to get my fill of the spice du jour I came up with my own pumpkin pie-flavored concoction. 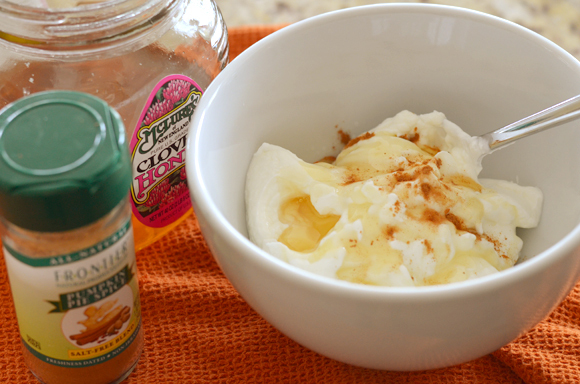 Pumpkin Pie Spice Greek yogurt! Here's what you'll need. Add the first four ingredients to a cereal bowl and mix until blended. Add the granola and a few slices of apple and you have the perfect fall-flavored breakfast! So easy. So good. These flavors were so good together that you better believe I tried it with my morning coffee. Yep. Add a dash of spice, a splash of vanilla extract and a bit of honey and you have a heavenly homemade pumpkin-spice flavored coffee. Take that, Starbucks! ohhhh thanks for the idea! sounds delicious!! 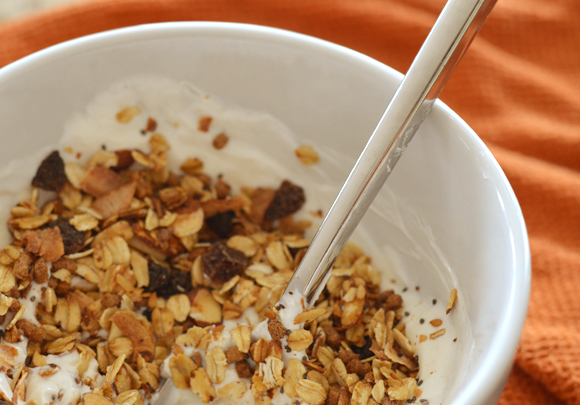 Yummy, spiced yogurt sounds delicious right now - far more exciting than my cereal and almost as easy! That sounds wonderful! Made a wallet-busting trip to Whole Foods yesterday to restock our house and have a huge container of greek yogurt just waiting to be jazzed up. Australians don't do the pumpkin as a sweet food thing. Pumpkin is a savory vegetable for making soups out of or roasting or putting in risotto. I think I've only tried pumpkin pie once & didn't really like it. Everyone raves about pumpkin spice lattes, so if we're ever in America in the fall, I'll have to try one. Oh, this looks so good! I am currently addicted to Target's Greek yogurt with honey-- I think the brand is The Greek Gods-- such a yummy treat (and great breakfast too)!